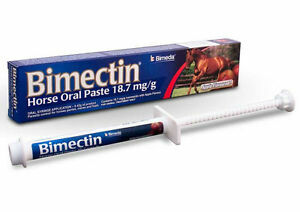 Get rid of parasites in your horse when you administer this Bimectin ivermectin 1.87% anti-parasitic medication. This medication comes in a convenient single-dose package weighing 0.21 ounces, and it is designed for adult horses. Its paste formulation makes it easy to give to your horse, and the apple flavor smells and tastes good to the animal. This anti-parasitic drug is designed to get rid of bots as well as worms. It is for horses that weigh up to 1,250 pounds. US $0,00 aan verzendkosten voor elk volgende kwalificerende object dat je koopt van pepdogs. Directe betaling van US $5,95 is vereist.